Continue Magic Lantern Audio 2 through slide 7. 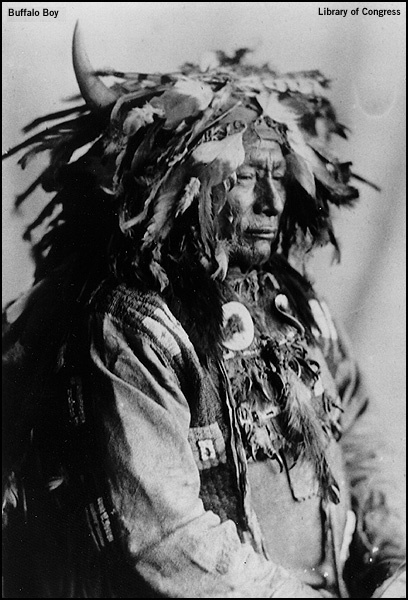 THIS IS A LAKOTA SIOUX called Buffalo Boy-Tatanka Hoksila (tuh-TONKA HOCK-sill-uh). His name comes from a boyhood dream he had of a buffalo. You can see the horns in his headdress. 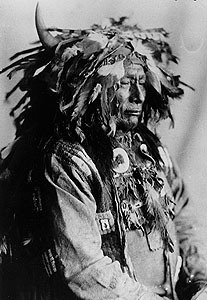 Buffalo Boy twice participated in the sacred Sun Dance...dragging six buffalo skulls attached to his body by tethers hooked to quills piercing his skin. It was part of his vow he made to the spirits in return for success in warfare against an enemy tribe.